French cuisine is among the most celebrated on Earth and French culinary customs hold fascination for lifestyle observers too. There is a convivial nature around the entire process, with high importance placed on shopping for the best ingredients, planning the menu, and sitting down at the prescribed hour to enjoy it together en famille. The pace of the day is set around meal times, comprising a light breakfast followed by a three-course lunch and a similarly substantial dinner. 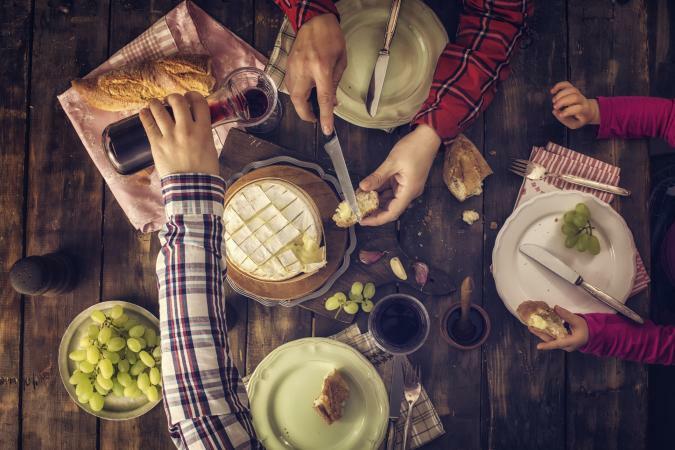 At home, French dining etiquette connected to meals is less formal than you may think. Most of all, it is important to relax and gather round a table to eat and talk. The French don't approve of grazing, scrounging around in the fridge, grabbing a snack on the go, or standing over the sink to munch on an apple. Dropping coins into a vending machine that dispenses candy bars, potato chips, and soda isn't a viable option in the accepted French way of life. Some say you could set your watch by meal times served in traditional French homes. Contemporary urban lifestyle and work schedules mean there is more flexibility around breakfast times. Still, it is de rigeur to sit down for lunch at 1 p.m. and to pull up a chair for dinner at 8:30 p.m. Lunch and dinner are hearty affairs and there's little need for-nor acceptance of-mid-afternoon snacking. In Paris restaurants, an 8:30 p.m. supper is on the early side and a later dinner hour is more fashionable. Night owls can find late dining until 2 a.m. at a brasserie or a bistro in major cities. Outside the large cities, restaurants typically close between lunch and dinner and it's difficult to find a kitchen serving lunch after 2 p.m. or dinner after 10 p.m.
Each of these three specialty items is essential to the culture and traditions of French food. Together, they make the perfect, affordable lunch to enjoy en plein air, to take with you wherever you like. Fresh baked bread daily cannot be overemphasized as a part of French heritage. Quality selections from the bakery span the gamut from long crusty baguettes to light flaky croissants. Stopping to pick up something to bring home from the boulangerie is a simple gesture of sharing family love. And consume it they do; according to recent studies by research firm Euromonitor, France has 32,000 independent bakeries and bread lovers buy 10 billion baguettes every year. 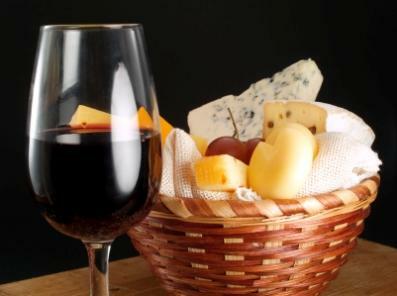 Combine your baguette with wonderful French cheeses and a bottle of reasonably priced French wine and you've got an instant picnic. You don't need a cutting board or knife; baguettes are designed to be torn off in bite-size chunks. This all-time favorite is perfect for any season and just right for an impromptu pause to rest, chat, and conduct people-watching while seated on a park bench. Join the locals when you grab a great seat for more people-watching from a table at a sidewalk café. Order coffee, a lemonade (citron pressé), a carafe of wine, or a sparkling water. The art of passing time lingering in a French café, whether in conversation or alone with a newspaper, is what lazy French days have been made of for centuries. Nowhere does "café society" better than Paris where thousands of neighborhood cafés are central to the ebb and flow of authentic French joie de vivre. In France, every proper lunch and dinner revolves around a main course consisting of meat, fish or poultry. Well-known, classic French dishes bear this out. A wide variety of meats may command the spotlight at the center of the table, including beef, pork, lamb, veal and rabbit. 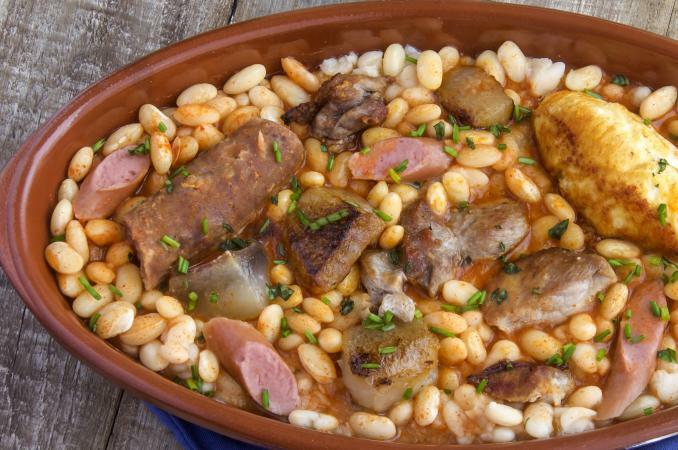 Popular national dishes include Burgundy beef (boeuf bourguignon), veal stew (blanquette de veau), leg of lamb (gigot d'agneau) and Toulouse-style cassoulet with pork and beans. Chicken and duck are the main ingredient for traditional dishes such as chicken Dijon, chicken braised with wine (coq au vin), duck à l'orange, and duck breast (magret de canard). Turkey with chestnuts or a roast goose make up the standard Christmas meal. The fishing industry is important and France is fortunate to have more than 2,100 miles of coastline from the English Channel to the Atlantic Ocean and the Bay of Biscay to the Mediterranean Sea. Expect to find delicious boat-to-table dishes served regularly, including pan fried sole (sole meunière), salmon in paper (salmon en papillote), grilled tuna Provençal and broiled swordfish à la Niçoise. Don't miss the thick Provençal Bouillabaisse stew from Marseilles packed with shrimp, mussels, clams and monkfish. The French enjoy lobster thermidor, scallops in creamy wine sauce (coquilles Saint-Jacques), marinated mussels (moules marinières) and excellent oysters sourced from the chilly water off the northwest Atlantic coast. Throughout the various regions of France, dining is both a pleasure and a deep-rooted ritual. UNESCO declared French gastronomy to be an Intangible Cultural Heritage of Humanity in 2010. This cultural arm of the United Nations recognized French culinary culture as "a social custom aimed at celebrating the most important moments in the lives of individuals and groups."